Lacanau is a real boardsports mecca, with more than 14 km of huge, white sand beaches. Everywhere you look there are wide open spaces stretching away into the distance, gently-undulating sand dunes covered with marram grass and huge expanses of blue water! Very close to the campsite, holidaymakers will also be able to enjoy surfing, bodyboarding or just bathing in patrolled areas (from mid-June to early September). Lacanau lake is just a few kilometres from the campsite, and comprises an area of 2,000 hectares, with a watersports centre for people who enjoy kitesurfing, watersports, canoeing and standup paddleboarding. A seaside resort with character and some lovely beaches! You'll love the atmosphere here, with pastimes that include surfing, relaxation, golf, horse riding and trips to the casino. Come and discover the region's seaside and forest on foot or by bike, and don't forget to visit the Étang de Cousseau nature park. Wander through the discovery circuit that takes in the former seaside villas, or why not try a night-time outing in the bustling town? Bordeaux is the world's wine capital and is an amazing place, with a rich history and some remarkable architecture. Sixty kilometres away from the ocean, it owes its fortune and influence to its harbour and its wines. Enjoy a boat trip along the Garonne, take the family to see the Miroir d'Eau, stroll along the quaysides, wander through the public gardens and explore the old city of Bordeaux and its 18th century architecture. This is a city that is overflowing with museums to come and visit as soon as you can. Tickets available from Kiosk info (special prices available). Set sail for an immersive experience finding out about wine cultures and civilisations! The world famous Cité du Vin lies in the city of Bordeaux, and provides an opportunity for an amazing journey around the world, through the ages and through the cultures. Its architecture is a journey in itself! By going there you will discover vineyards from all over the world, via a permanent tour with a rich and varied cultural programme, tasting workshops and educational workshops for children! On the menu are tastings, sensory installations and areas dedicated to art and wine. Bordeaux's Cité du Vin has 700m² of temporary exhibition space. From its belvedere you'll enjoy amazing views over Bordeaux while enjoying a glass of wine! Close to LACANAU, the Bassin d’Arcachon is a whole new destination, with hugely varied scenery! So make the most of your stay at the Yelloh! Village Les Grands Pins by coming to explore this unique region. Step aboard a boat and discover the Île aux Oiseaux with its huts on stilts: this is a genuinely wild area home to various different species of bird. And in front of it stand the huts on stilts (cabanes tchanquées), which are so symbolic of the Bassin d’Arcachon. Come and visit Arcachon and the Dune of Pilat, Europe's highest, reaching 105 metres. From here there are amazing views over the Banc d’Arguin, the entry to the Bassin d'Arcachon, and Cap Ferret. Explore the peninsula of Cap Ferret, its lighthouse and its characteristic oyster-farming villages, where you'll be able to try oysters right at the water's edge! The Dune du Pilat lies between the Atlantic Ocean and a pine forest, and has won fame as the tallest sand dune in continental Europe. It is also the only one that's still moving! Created by the erosion of the mountain massifs, this extraordinary natural monument, 2.9km long, 616m wide and 110m high, will prove a winner with the whole family! People use different methods to climb this splendid pile of sand, with some using the stairway and others climbing directly up the sand. And once you reach the top, this listed location, which sees 2 million visitors every year, provides amazing views, including the huge ocean beaches, the forest of La Teste de Buch, the Bassin d’Arcachon, l’Ile aux Oiseaux, and the Cap Ferret peninsula. This is a climb that really takes your breath away! The Cap Ferret peninsula is a real bit of paradise that separates the Atlantic Ocean from the Bassin d’Arcachon, and forms a gorgeous and authentic location in which nature rules supreme. Fringed by the pine forest, the beaches and the sand dunes, this seaside resort with its laid-back atmosphere has some down-to-earth times in store for you, with the emphasis on relaxation and being together. The 25km that make up this peninsula pass through no fewer than 10 villages, including Lège and Cap Ferret. Whether you're travelling on foot or by bike, come and enjoy some lovely strolls and explore the variety of gems you'll find here, which include the oyster-farming village of Le Canon, la Réserve Naturelle Nationale des Prés Salés (saltings), the village of l’Herbe, the Cap Ferret lighthouse and 25km of beaches too! In the middle of the estuary, halfway between Royan and Le Verdon-sur-Mer, stands the majestic Cordouan lighthouse. Surrounded by a vast sandbank at low tide, this is the oldest operational lighthouse in France and the last remaining offshore lighthouse open to the public. So if you've ever dreamed of visiting the Cordouan lighthouse don't miss the opportunity of a boat trip! The journey takes 45 minutes, with the timetables changing daily according to the tides. The lighthouse keepers welcome visitors to Cordouan from April to 1 November, delighted to open the doors to what many describe as the Versailles of the seas! One of the most striking aspects of Cordouan is the beauty of its stone and its rich decoration, notably in the chapel dedicated to Our Lady of Cordouan. After landing, you cannot help but admire both the monument itself and its setting, as you follow the small stone causeway that leads to the lighthouse. With 311 steps to reach the top, the most spectacular view in the region requires a little effort, but the reward is breathtaking. And not simply the view itself, but the calm serene atmosphere and the uniqueness of the experience, the impression of being suspended between the estuary and the Atlantic Ocean! Saint Emilion is a pretty little mediaeval village in the Gironde, just a 40 minute drive from Bordeaux. It is famous worldwide for its prestigious red wines, its very well known wine appellations which include grands crus classés, and its splendid winemaking châteaux in the surrounding region. Despite its small scale, this village is home to all sorts of wonderful features, including its underground area (catacombs, the Ermitage cave etc. ), as well as having a rich historic and religious heritage. Saint Émilion is listed as a UNESCO World Heritage Site due to its historic and unique winemaking areas. Make the most of it by spending a few days camping at the Yelloh! 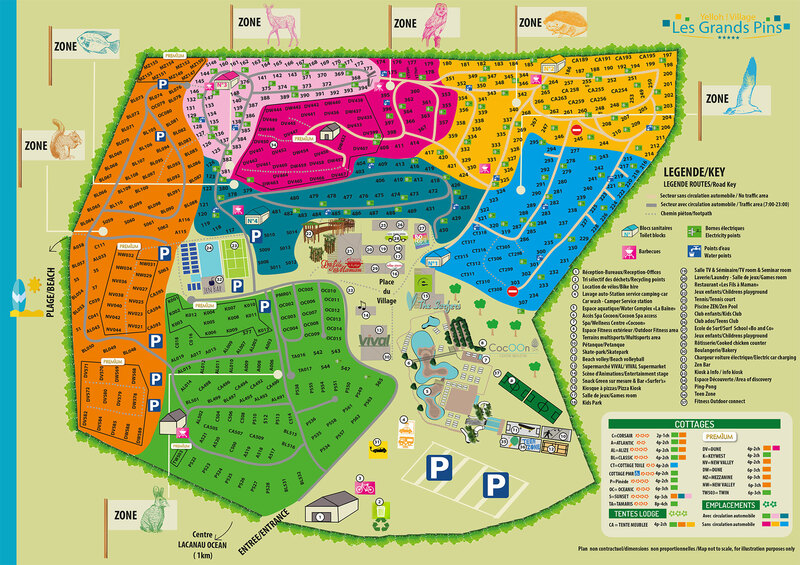 Village Saint-Emilion, which lies just 3km from the mediaeval village, in the heart of a tree-filled 10 hectare setting, with a lake and a lovely heated aquapark! You'll love our fertile region, with its unrivalled produce and fantastic food! Lying at a point at which the best dishes of south-western France come together, it's a real festival of flavours, with oysters, fish and seafood from the sea, and Pauillac lamb, Bazas beef and steak with marrow cooked on vine shoots from the land. Seasonal dishes include cèpe mushrooms, truffles, foie gras and grapes, duck breast and duck confit, speciality cheeses and plenty more! In Aquitaine, cooking is also a way of life! Come and discover our regional produce at Lacanau-Océan market, which is held on Wednesday mornings throughout the year. Come and wind your way through the Route des Châteaux, a journey that takes you through some of France's greatest winegrowing areas. Here, there are 8 Appellations d'Origine Contrôlée that include Margaux, Saint Julien and Pauillac, whilst the prestigious wine stores and estates of more than 750 slightly less renowned producers also await you, as well as the region's vine-centric châteaux and monasteries! With tastings, cellar tours and wine discovery, there's a whole world of things to discover! Meet the passionate winemakers here!